On July 28, Maryland State Delegate Tom Hucker visited Bethesda Green as part of the Business Incubator’s monthly Luncheon Speaker Series for a discussion on recent developments in environmental policy and legislation in Maryland. Delegate Hucker has a well-established record of supporting and championing bills that promote sustainability, conservation, pollution control, and green business on the state level, and has been recognized as a 100% Environmental Voter by the Maryland League of Conservation Voters and Environment Maryland. The meeting was fairly well attended by Bethesda Green staff, members of several of our incubator companies, and numerous local green business owners and representatives. After a series of introductions from everyone in attendance, Hucker launched into an presentation of “wins” and “losses” for the environmental movement in Maryland’s 2010 legislative session. Passage of SB 179, which requires the Public Service Commission to establish a pilot program for charging electric vehicles in Maryland. This bodes well for the future of electric vehicles and charging stations and their potential as a large growth industry in Maryland. Passage of SB 717, which allows owners of solar thermal systems to receive solar renewable energy credits. Passage of SB 595, which extends the shareholder liability protections of benefit corporations, companies that commit to improving the environment as well as making a profit, to Maryland limited liability companies (LLCs). Along with the wins, however, came losses. The largest one in particular was the failure of HB 1054, the Maryland Offshore Wind Energy Act. Despite the disappointing defeat, Hucker is working with advocates in support of passage in 2012 (see his website for more details). Political philosophy. On any given bill, some delegates will automatically support it, some will automatically oppose it, and some will be on the fence. It is this third group that is most instrumental for determining a bill’s success. Press. The attention of the press adds pressure to legislators to consider all bills carefully. PACs. The financial support coming from PACs is a strong persuader when legislators cast their votes. Personal persuasion. In addition to funding, lobbyists with well-established relationships with delegates can have an effect on the way they vote. People. This is the “P” that most constituents can influence the most. According to Del. Hucker, people so rarely contact their delegates that as few as five or ten emails from people on any one subject can convince a committee that it’s an issue that their constituents care about! An additional “P” that Del. Hucker closed his talk with was “Persistence.” This means writing, calling, or even meeting with your political representatives to discuss an issue or a bill you want to see passed. And maybe next legislative session, with that last “P” in mind, we can help make Maryland a more sustainable place to live. A Bethesda Green intern, Christian Schorn is studying environmental science as a junior at Connecticut College. Ribbon Cutting for Maryland’s First Wind Farm – Constellation Energy held a ribbon cutting ceremony last week at the site of Maryland’s first commercial wind farm. Constellation’s 28 wind turbines, spread along eight miles of Backbone Mountain in Garrett County, can produce enough electricity for 23,000 homes. Reporter Scott Calvert of the Baltimore Sun reports on the mixed reviews the turbines are receiving from Garrett County residents. More American Families Growing Their Own Veggies – The National Gardening Association says the number of U.S. households with food gardens grew from 36 million in 2008 to 43 million, or 37% of all households, in 2009. Four out of five home gardeners have at least some college education, while two-thirds of them are over 45 and a slight majority are women. For more information, see the attractive infographic on the Mother Nature Network, or mnn.com. Car Sharing Provides Multiple Benefits to City of Baltimore – Zipcars, Inc., which has provided car sharing services in Baltimore for the past year, has released results of a Baltimore member survey showing multiple benefits for the city, as well as for Zipcar drivers. Nearly half the survey respondents were able to avoid buying a car, while 18% sold their existing cars. Some said they drive less and walk, bike and use public transit more than they did a year ago. For the city, fewer cars means less pollution, less congestion and less competition for parking spaces. Sustainable Food Jobs – Sustainablefoodjobs.wordpress.com has been around since 2009, so this may not, strictly speaking, belong in a news roundup, but if you are interested in the field and not familiar with the site, it is well worth visiting. Unlike the many sites that waste your time with jobs that are unrelated to your search term, all the listings I have seen are actual sustainable food jobs! The site also provides links to college programs in sustainable agriculture as well as sustainable food blogs and companies and organizations you can contact for information and networking. Volunteers Needed to Distribute Recycling Info at MC Ag Fair – The Montgomery County Department of Environmental Protection seeks volunteers to staff recycling information tables during the upcoming County Agricultural Fair, August 12 – 20. To volunteer or request additional information, contact the Recycling Volunteer Program at (240) 777-6445 or ana.arriaza@montgomerycountymd.gov. The Buy Local Challenge, July 23 – 31. Support Maryland farms. Eat at least one thing from a local farm every day during Buy Local Week. And, bring the challenge to your workplace today. BG 101, Thursday, July 28, 4 – 5:30 pm. Bethesda Green’s monthly orientation session. Learn about Bethesda Green history, programs, upcoming events and volunteer opportunities. Home Canning Demonstration, Saturday, July 30, 10:30 – 11:30 am. Learn to can food at the Bethesda FreshFarm Farmers Market at Veteran’s Park, corner of Woodmont and Norfolk. Join Bethesda Green and Full Plate Ventures to enjoy the gastronomic pleasures of three local, seasonal, and home-style meals while meeting those who are building a healthy, local, sustainable food system in our region. Register early; space is limited! Closing the Loop in Our Food System: Breakfast, Panel Discussion & Optional Farm Market Visit, Sunday, August 21, 9:00 am – 1:00 pm. Location: Bethesda Green & Bethesda Central Farm Market. More information here. Fertile Ground: Local Sustainable Farm Tour and Lunch, Saturday, September 10, 12:30 – 3:00 pm. Location: Rocklands Farm, 14525 Montevideo Rd., Poolesville, MD 20837. More information here. Savor Local Flavor: Four Course Dinner and Discussion with Chef Tony, Monday, September 19, 7:00 – 10:00 pm. Location: Chef Tony’s, 4926 St. Elmo Avenue, Bethesda, MD 20814. More information here. New ‘vampire power’ research from Savenia Labs helps consumers save energy and money. New research shows that the most energy hungry microwaves on the market today cost as much as $30 to run when not in use – in large part due to the clock. These surprising early results were found after testing the top 20 microwave ovens sold in the United States at Savenia Labs, a University of MD Clark School of Engineering partner company in Bethesda, MD. ‘Vampire power’ also known as standby power was shown to consume more than 1/5th of a microwave’s total energy consumption over its lifetime. When added to other appliances and electronics in your house, vampire power costs can add up to almost $200 per year for Maryland residents. Unplug your microwave and when you plug it back in, don’t set the clock. Testing shows this can cut vampire power use by 50% in some units. Unplug your small appliances when you go on vacation, or when not in use. Use a smart strip to make it easy to power off your small appliances and home electronics when not in use. Solar Installation Completed at Bethesda Synagogue, Adat Shalom – With 180 new, American-made solar panels on its roof, Adat Shalom expects to generate 50,000 kilowatt-hours of electricity every year. A project originated and developed by Kenergy Solar, the array was installed by Baltimore-based S.H. Silverblatt Electric, a Maryland Women-Owned Business Entity (WBE). Altus Power Management owns the solar system and is responsible for financing, operating and maintaining it. The synagogue incurred no construction costs, and will buy the generated power from Altus for the next 20 years for less than it would pay for power from the grid. Federal and state grants helped make the project possible. More information here and here. Residential Clean Energy Grant Applications Are Growing Steadily – but not evenly. Grant applications filed with the Maryland Energy Administration for residential solar installations far outstrip those for wind installations, which lag behind geothermal as well. It appears local zoning ordinances overwhelmingly approve of rooftop solar. Most Maryland cities, towns and counties, on the other hand, have yet to decide their position on wind turbines; some have banned them from their jurisdictions. Barbara Pash, at baltimore.citybizlist.com, reports on the numbers and trends of the past few years. Maryland Offshore Wind Farm May Be Half What O’Malley Wanted – The (Ocean City) Dispatch reports that a Federal Environmental Assessment recommends reducing the area available for an offshore wind farm off the Maryland coast from around 206 square miles to ninety-four. The proposal to downsize was made after the U.S. Coast Guard expressed concern about the possible danger that the larger size wind farm might pose to coastal ship travel. Hybrid Vehicle Scorecard Issued by Union of Concerned Scientists – The UCS compared thirty-four hybrid vehicles in two categories: luxury and non-luxury models. The scorecards compare the vehicles on four different measures: fuel efficiency, pollution relative to each car’s comparable non-hybrid model, cost-effectiveness, and the degree to which upgrade features are forced on the buyer as standard equipment. Topping the list of luxury models are the Lexus CT 200h and Lincoln MKZ Hybrid. Among non-luxury models, the Toyota Prius stands head and shoulders above the rest. The scorecard is available here. Good information in the press release here. Forest and Tree Conservation – Forest Conservation Advisory Committee, Tuesday, July 19, 7:00 – 9:00 pm. This meeting of the Montgomery County Dept. of Environmental Protection is open to the public. See the DEP Calendar of Events for address and contact information. Conservation Landscaping Training, Saturday, July 23, 1:00 – 3:00 pm. Learn how to select, install and maintain native plants at Croydon Creek Nature Center in Rockville. To register, call the RainScapes Coordinator at 240-314-8877 or e-mail rainscapes@rockvillemd.gov. Activist Workshop Sponsored by Environment America, Saturday, July 23, 1:00 – 4:00 pm. The workshop will cover the best techniques for organizing your neighbors to take action, and the best ways to persuade your local media to cover an issue you care about. Central Arlington Library, 2100 Clarendon Blvd., Arlington, VA 22201. RSVP. 22nd Annual Farm Tour & Harvest Sale, Saturday & Sunday, July 23 & 24, 10:00 am – 4:00 pm. Celebrate Montgomery County’s agricultural heritage at a dozen local farms. Purchase fresh fruit, vegetables, flowers, and plants – and the kids can pet the farm animals. Hooray! Rain Barrel Information Session, Sunday, July 24, 1:00 – 3:00 pm. This free information session at Twinbrook Community Recreation Center, 12920 Twinbrook Parkway, Rockville, teaches how to select, install and maintain a rain barrel and how this storm water management technique helps protect city watersheds. To register, contact Amanda Matheny at amatheny@rockvillemd.gov or 240-314-8877. On June 30, an international group of women visited Bethesda Green to share ideas and lessons learned about building sustainable communities. The women were participating in a Global Women in Management Workshop sponsored by the Centre for Development and Population Activities, a group dedicated to empowering women to empower communities. The visitors are actively working in a variety of fields to strengthen women’s equality and economic independence, providing medical and emotional support, and education and training, all for sustainable development. Going around the table, each woman introduced herself and country of origin: One woman from Angola, another from Argentina, one from China, Ghana, Indonesia, Kazakhstan, Mexico, Nigeria, Papua New Guinea, Russia, Turkey, and Vietnam. After introductions, the women asked questions about starting new businesses, such as: How do you fund-raise? How do you distribute loans or grants? What’s the business incubator and how does it work? Each women jotted down notes while Bethesda Green staff answered their questions. Throughout the meeting the women told their stories and experiences of their progress and challenges, offering inspiration and hope for women in the future. Opportunities in some countries are restricted by the government, culture, and economy, but these empowered women are fighting to revolutionize the independence of women in their homelands. One could feel the electricity of support, equality, and change that is soon to come. We’re grateful for the chance to hear their stories and proud to offer our encouragement and support. Deadline Tomorrow: Nominations for Bethesda Magazine 2011Green Awards – Nominate local individuals, businesses, non-profits, neighborhoods, school organizations, condo associations or faith-based organizations from Montgomery County or NW DC by Tuesday, July 12. Winners will be profiled in the November/December issue of Bethesda Magazine and recognized at the Bethesda Green Gala on October 5, 2011, at the Round House Theatre in Bethesda. Maryland, DC and Virginia Create New, Green Jobs Database – The Mid-Atlantic Regional Collaborative’s (MARC) Green Consortium last week announced their new green jobs portal, available at www.marcgreenworks.com. The MARC Green Works Jobs portal provides free, real-time job search and recruitment tools for DC, Maryland and Virginia jobseekers and employers. In addition, the portal provides real-time labor market data (area profile, occupation profile, industry profile, and labor market facts) to help jobseekers and employers make real-life decisions. Montgomery Parks Foundation Invites You to Join the “Friends of Montgomery Parks” – The non-profit foundation is appealing to local residents and businesses to help counter county budget cuts that are hurting our parks. According to the Foundation website, “Over the past 10 years, the total acreage managed by M-NCPPC Montgomery Parks has increased by 11% to over 35,000 acres….Over the same time period, the staff available to support the work program has decreased by 22% and funding has been declining at an alarming rate for the past three years.” Membership is $35 and includes an invitation to a special, members-only night at Brookside Gardens “Garden of Lights,” Wednesday, November 23, 2011. WUSA9 story here. Foundation website here. In the first quarter of 2011, renewable energy sources (biomass/biofuels, geothermal, solar, water, wind) accounted for 11.73% of U.S. energy production or 5.65% more than energy produced from nuclear power. The 11.73% represents a 15% increase from first quarter 2010 and a 25% increase from first quarter 2009. Biomass/biofuels accounted for half, hydropower for one-third and wind for one-eighth of the renewable energy, while geothermal and solar provided 2.45% and 1.16%, respectively. Scaling Up Residential Biomass Heating: A Stakeholder Symposium, Wednesday, July 13, 2:00 – 4:00 pm. Free symposium “explores the opportunities for policy makers to maximize the potential of residential wood heat to reduce fossil fuel use…” Location: US Forest Service, 201 14th St. SW (14th & Independence) in the Yates Training Room. RSVP is required. Bethesda Green Education, Outreach and Marketing (EOM) Group Meeting, Thursday, July 14, 4:00 – 5:30 pm. This team of volunteers meets on the second Thursday of every month to discuss Bethesda Green’s marketing and communications needs. New members are encouraged to join. 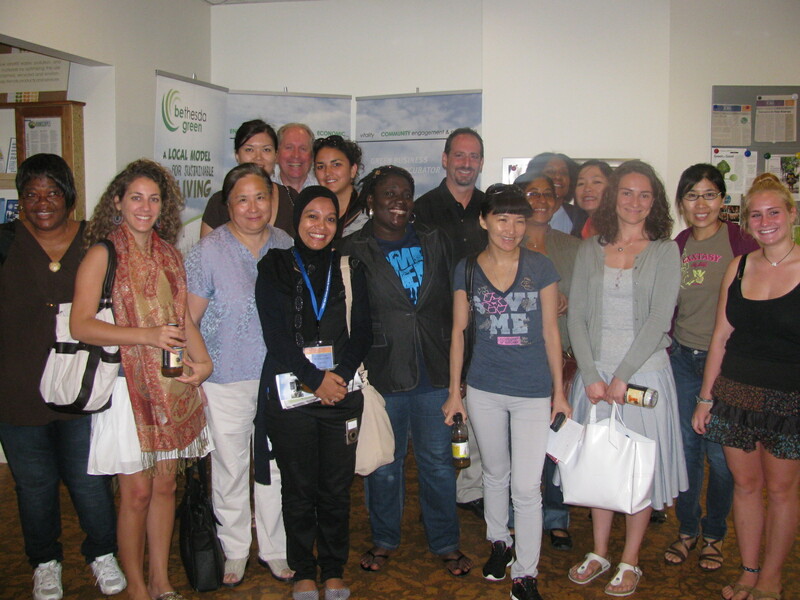 Green Wheaton, 2nd Annual Green Drinks Networking Happy Hour, Thursday, July 14, 5:00 – 8:00 pm. Come to the Royal Mile Pub, 2407 Price Avenue, Wheaton and meet friends from Green Wheaton and the Wheaton & Kensington Chamber of Commerce. Register to attend. Mid-Atlantic SPROG, July 31-Aug 7. The Sierra Club Student Coalition annual summer training program for student environmental leaders is accepting applications. High school and college students will spend the week at the Hard Bargain Farm in Accokeek, Maryland, learning to organize and manage environmental campaigns. They will also meet like-minded students from around the mid-Atlantic area and most likely have a great deal of fun. Nominations are being accepted for the 2011 Bethesda Magazine Green Awards, sponsored by Bethesda Green. The Green Awards recognize businesses, non-profits, communities and individuals that are leading the local fight to protect the environment. Know someone, a business, or group worthy of recognition as a green champion? Anonymous or self nominations are welcome. Deadline for submissions is July 12, 2011. Winners will be profiled in the November/December issue of Bethesda Magazine and recognized at the Bethesda Green Gala on October 5, 2011, at the Round House Theatre in Bethesda. Businesses or non-profit organizations whose primary focus is producing and/or selling innovative green products, providing innovative green services, and/or promoting a green lifestyle. Businesses or non-profit organizations not involved in providing green products or services, but that have significantly incorporated green practices into their culture and operations. Communities (neighborhoods, school organizations, condo associations, faith-based organizations etc.) that are promoting and implementing green practices. People, 19 or older, who are actively promoting and living a green lifestyle. People, 18 or younger, who are actively promoting and living a green lifestyle. To be considered, businesses, non-profit organizations and community groups must be based in Montgomery County, Maryland or Upper Northwest Washington, D.C. (ZIP codes 20015 and 20016). Individuals must have their primary residence in the above areas.